There is no end to reviewing the implementation of Mikrotik features. One of the many widely used features is Hotspot. There are many who implement the Mikrotik Hotspot feature in the field, maybe you are one of them. Most people call if there is internet access distributed via wireless in the public area (cafe, mall, etc.) it is a Hotspot service, while actually Hotspot in Mikrotik is a system to provide authentication feature on users who will use the network. So to be able to access to the network, the client is required to enter the username and password on the login page provided. From the above explanation, means Hotspot not only point to the wireless network only. 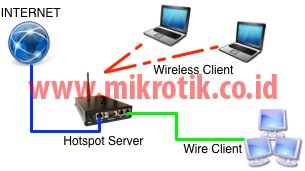 Hotspot feature can be applied in all types of network interfaces such as ethernet base. To build an authentication system on Hotspot, Hotspot is actually a combination of Proxy, Firewall, DNS, DHCP and others. But you to create a hotspot server does not have to worry about kekomplekan function because in Mikrotik you are given "Help" in the form of Setup Wizard to make it. By using a hotspot server on your network, you can then do the limitation based on how long the user access network (uptime), access speed (data rate), many data that has been used (quota based), even policy firewall policy. This limitation can be applied per user or maybe per group of your network. Have you ever had the hassle of changing every IP connected to someone else's wireless network? Or maybe there is a case in the device User has a security that resulted in the user is not allowed to change-change the IP on the device? By using Hotspot Server, you do not have to worry about it anymore. Users can use any static IP in the device or DHCP, then automatically Hotspot server will do one to one natagar client can access to our network. Normally, all connections from various devices in our Hotspot network will be blocked before login / authentication to the hotspot server. But not all devices can perform such authentication system, for example: Printer server, IP Cam, VoIP server and so on. Or there is a special VIP user does not need to login. For the devices you want to bypass, there is no need to login for access to the network, you can use the feature called IP Binding. Using the advertisement feature on the Hotspot server, you can display a popup page of a web to your user and popups that will appear can be set to interval. Maybe for those of you who are involved in the world of internet services, want to give a trial period / trial to your prospective customers, with the aim of ensuring the quality of your network. Well, on this Hotspot server there is a trial function that allows the user does not need to login until the specified time limit. After that new user is required to login. Have you ever bought a GSM credit voucher? or maybe the internet service in hotels that require us to request vouchers at the concierge? in Mikrotik Hotspot, you can also create a prepaid voucher system for your prospective internet service customers. You specify the price and type / detail limitasinya, later every prospective customer who comes you live generate voucher which will contain custom username and password.